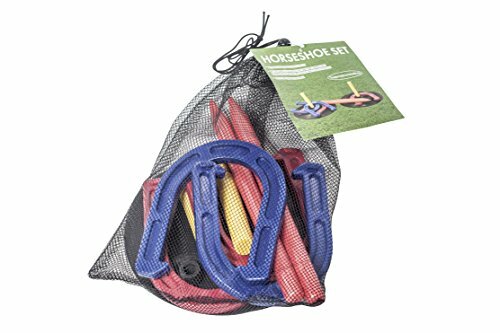 This plastic set of horse shoes is the perfect lightweight, portable, durable set of horse shoes for someone looking for an alternative to steel Horseshoes. Sacrifice the hassle of steel but keep the integrity of your horse shoes game just as high with this set! the set includes 2 Red and 2 Blue Horseshoes, 2 long sticks for outdoor play, 2 short sticks for indoor play and 2 plastic boards for inserting the stakes. By Trademark Innovations.